Crack Filling – Why Do Cracks Appear so frequently? Pavement cracks are inevitable happen over time. There is no way to avoid these cracks, but crack filling regularly will save money in the long run. The best strategy for avoiding unsightly pavement is to fix cracks as soon as they occur. Extreme weather over time does have negative impact on pavement. One of the main causes of pavement deterioration is water intrusion. Water gets into tiny cracks in the pavement, freezes and expands causing these cracks to get larger. This deterioration can then extend to the sub-grade base causing serious damage. Crack filling should be part of your post season maintenance, before you incur major losses. Filling should be done on any cracks that are immediately visible. Filling the cracks at least once every year (after the freeze-thaw season ends) will extend the usable lfe of the pavement. Cracks cannot be filed when it is cold. Cracks should be filled during the warmer weather between May and November. In the colder months, cracks expand and when temperatures rise the cracks contract. The crack filling materials will be too thin when it is cold and some of the cracks might reopen. Even though the filler material is designed to adjust to temperature fluctuations, these materials are not designed for extreme weather conditions. Crack filler is applied when it is hot at a temperature of about 300 degrees and it is packed tightly into the cracks. The crack filler actually expands and contracts as temperature rises and falls. If the size of the crack is too big (you can fit a coin into the crack) the crack should be patched with patching material. The patching material fills the the crack and then with the crack filler added, the two materials eventually bond together. The materials most commonly used for repair are a combination of asphalt patch (easy obtained through Home Depot or Lowes) and small crushed gravel. Before patching the crack it is essential that the cracked area be as clean as possible. 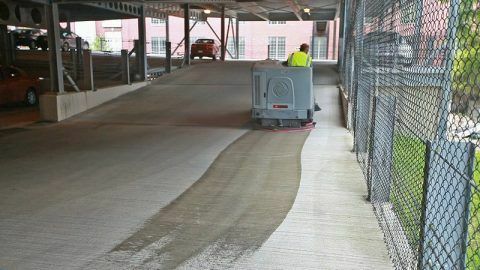 Clean off dust and loose debris so that the patching material can adhere without obstruction. If needed, use a chisel and a hammer to remove jagged edges and use a wire brush. Flush out any dirt remains from the crack and let it dry thoroughly before starting to fill. Heat up the edges of the crack with a flame torch and apply the patching material with a trowel (a garden trowel used for digging is fine). Pack the material with a mallet before applying the crack filler material. Remember, you can prevent future cracks and pavement damage by regularly inspecting for cracks. Ensure that you sweep your pavement or pressure clean it to remove damaging grit or debris. Crack filling on a regular basis will prevent your pavement from deteriorating prematurely, will last longer and will remain attractive for a lifetime. Have a large parking lot that needs crack filling? Looking to complete a large pavement crack filling project? Call us at 732-886-1940 and we’ll be glad to discuss you crack filling needs. Whether it is your home, office, or a commercial space, keeping your entrance and driveway clean shows you care. 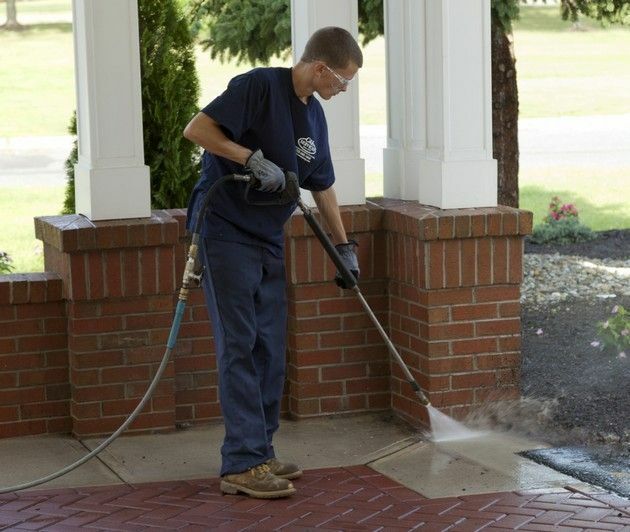 Power washing helps provide that care and enhances the property’s appearance. In spite of daily cleaning, maintenance and upkeep, conventional cleaning methods may not be enough to keep the driveways clean and in good shape. That is the main reason why there is a demand for power washing. There are other advantages and in this article we’ll cover a few. When there is a need for quick, thorough and efficient washing, power washing is the best option. It provides the deepest cleaning compared to hand brushing or simply hosing the surface with a hand sprayer. This generally restores the original looks and appearances of the driveway and other surfaces that can withstand this type of cleaning. 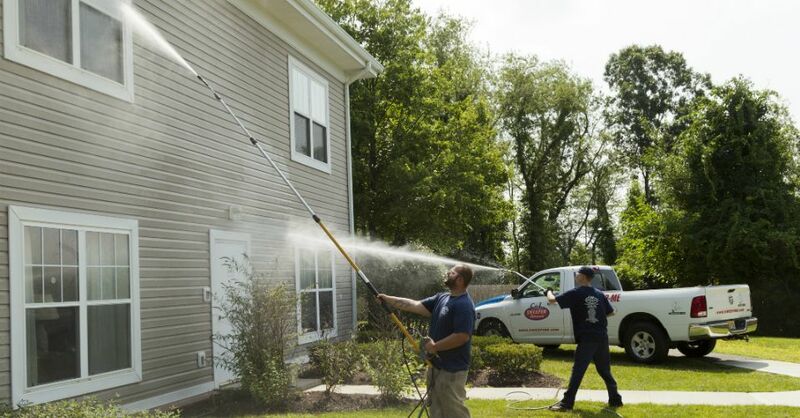 Though many might feel that power washing could be an expensive, just as many are surprised at how cost effective it can be. The results that power washing provides (in a very short period of time) and a fresh look of the clean area provide good value. If you see mold, lichen or moss growing on any of the surfaces of your property this is a red flag for potential property damage (and it’s an eyesore). Ignoring the growth of these micro-organisms could lead to damage or discolorations of property surfaces (concrete in particular). Although some companies power wash using just water, we recommend special cleaning solutions to insure effective cleaning. Though the mold and other microorganism could be removed temporarily through water pressure, they are likely to return if no other remediation is applied. A better option is to choose a chemical composition especially for the cleaning issue mixed into the power washing spray. This provides thorough cleaning and more permanent solution. There are some who question that the use of these chemicals might be potentially damaging to the environment. However, today there are many eco-friendly solutions available which ensure that there is proper deep cleaning without any damage to the ecosystem. Although washing with chemical based solutions could increase cost, this should not be the primary factor in the power washing project. The consequences of not using chemicals could generate the need for more frequent cleaning. In the long view, for a few pennies more, you have peace of mind and a surface that will stay cleaner longer. Looking for expert power washing? Give us a call at 732-886-1940. We’ll be glad to look at your property, give you a reasonable quote and ensure you’re satisfied when we’re done. You never get a second change to make a good first impression. 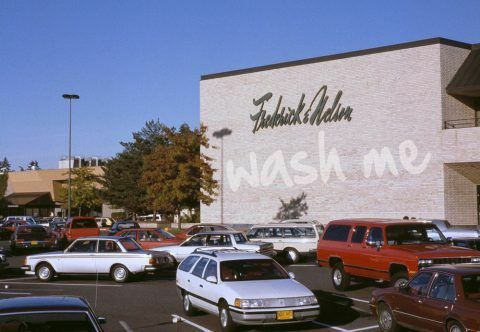 Office parking lots, shopping malls and other customer parking areas utilize parking lot cleaning and asphalt repair services to keep their lots looking clean. Although curb appeal may seem to be a small thing, clients judge an establishment based on appearance. Customers feel they are getting a warm welcome from locations that are in good repair. They feel uneasy about locations that are in disrepair. Parking lots typically use porous asphalt that can get very dirty in certain areas. Over time the dirt wears the pavement due to the constant friction from car and truck tires, garbage trucks and snow plows. A parking lot’s asphalt with an average life of about 20 years might not make half this span of time if not tended to. Winter weather increases the chance potholes because of freeze-thaw cycles. Water gets into asphalt cracks and expands causing the crack to develop further. This normal expansion of water causes the areas around the cracks to become weak which cause the asphalt to flake or crumble. 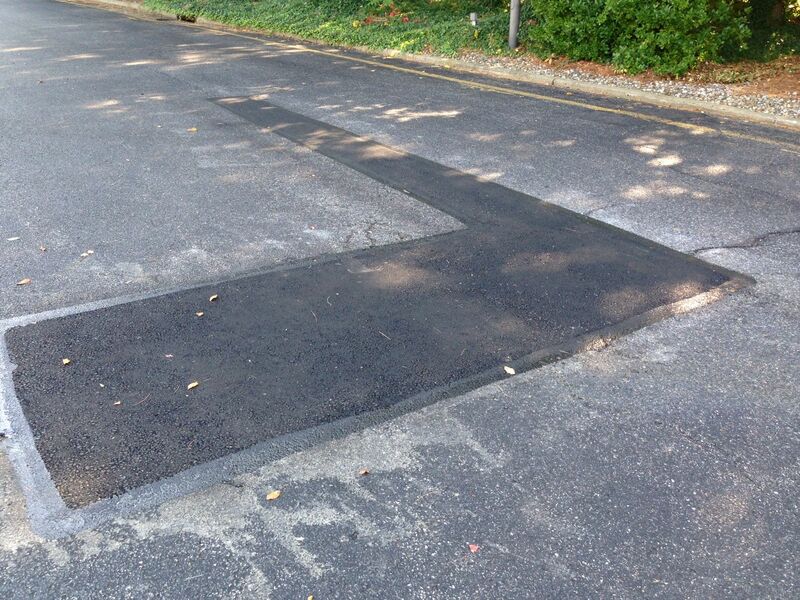 Ignoring the cracks leads to larger and larger asphalt repairs. Although necessary for safety, salt only aggravates the problem as it keeps water from freezing even at temperatures low enough for freezing to take place. Salted water does not evaporate as quickly as unsalted water, stays in cracks longer and accelerates asphalt deterioration. In the Northeast region of the US, asphalt is under constant freeze-thaw pressure and requires more asphalt repair and maintenance than other parts of the country. Sweeping your parking lot is regarded as a good maintenance practice not only for dirt and grit control, but storm water runoff as well. Sweeping your parking regularly keeps you compliant with the rules of relevant of local municipalities and state authorities covering the environment. With customized scheduling, we are able to reach every business that requires help with parking lot maintenance, sweeping and asphalt repair. Our personnel are capable of giving you the kind of clean that gives your asphalt a longer life. 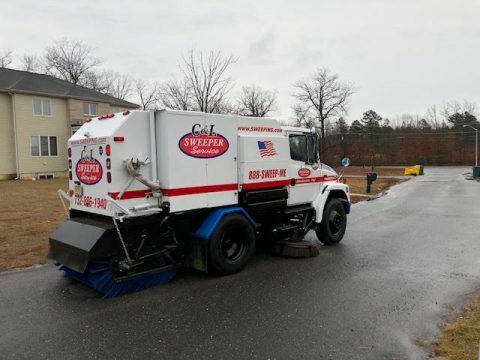 Our sweeping program can also be scheduled to match your business hours so that your property is clean and presentable at optimal times. From asphalt repair to parking lot maintenance, we are the expert in general maintenance. Give us a call at 732-886-1940. Finding the right paver for your paving project can be very complex and confusing. It is not that there is a shortage of decent paving companies. The opposite is true, there are plenty of paving companies out there. The problem is that almost every company advertises itself as the best. And given that most of them offer similar services, selecting the right one can be tricky. The ultimate question is: how do you look beyond the marketing hype to find the right paving company for your project? The best pavers have a solid track record of well-executed projects. Past accomplishments can provide a clear picture of a company’s ability to execute your project. As such, before hiring a paver, you need to review their past projects. Most pavers will actually give you references, often accompanied by photos, quotes or video testimonials. Do not take the testimonials at face value. Reach out to the references and ask them about the company, and see if they corroborate the company’s claims. If possible, visit the location which was paved and see the work for yourself. Checking out the references can give you a better picture about the paver. First of all, it can help you identify those who are dishonest. Secondly, it can enable you to see an actual completed project, and assess the quality of their work. For a paver to successfully accomplish the project, they need to have the right equipment. As such, before hiring a paver, you must ensure that they have all the vital equipment. The only way you can do this is by asking for their equipment list. The best paving companies are actually quite proud of their equipment. As such, they will gladly supply you with a detailed list. If a company is hesitant or dodgy about giving you the list, that should raise some red flags. It probably means that they don’t have some of the needed equipment. A great paver must be able to provide you with a detailed execution plan for your project. This plan should outline how they will accomplish your project. Such a plan should include timelines (i.e. start and end dates), materials, equipment, personnel and cost projections. Therefore, before selecting the paver, make sure that you are satisfied with their paving execution plan. At a minimum, you should be satisfied with the timelines and cost. If you are paving a community, generally the Homeowners Association (HOA) plays a central role in enforcing housing standards in certain communities. If your paving project will be carried out within a HOA area, then it needs to be carried out according to HOA standards. As such, you need to ensure that the paver is in a position to abide by these standards. The only way you can ascertain this is by verifying whether they have presented to HOA board members before previous projects. Do not hesitate to ask the paving company to come in front of your board for a presentation. In a nutshell, those are four critical things which you can use to evaluate a paving company. Other important things include the qualifications of their pavers, insurance for their workers and whether all their employees have undergone thorough background checks. Following these simple guidelines will ensure that you hire the perfect pavers to successfully complete your project. If you’re currently evaluating paving companies, we welcome you to cal us at 732-886-1940. We’ll be glad to show you our references, review our equipment list, and set up a cost effective paving plan.